When I was working on my thesis, I ate nothing but oatmeal, dark chocolate and Tabasco Cheez-Its. Weird. I ended up with a lot of heartburn from those tiny spicy crackers and haven’t have any since. I went through a box every couple of days and haven’t been able to bring myself to buy them again. Partially because I don’t know if I would still like them or just associate them with thesis production. I also can not control myself with these guys. A handful here, and another couple there. Before I know it, the box is empty and I end up with a feeling of deep shame. 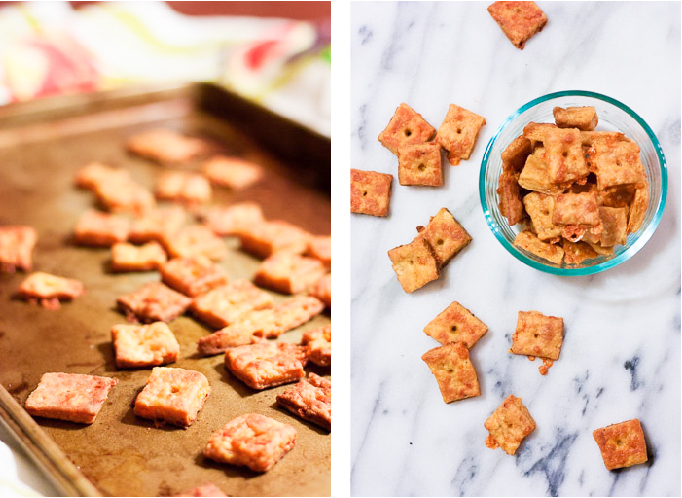 One day, my friend Kieran asked, “ever made your own Cheez-Its before?” I was kind of taken aback. 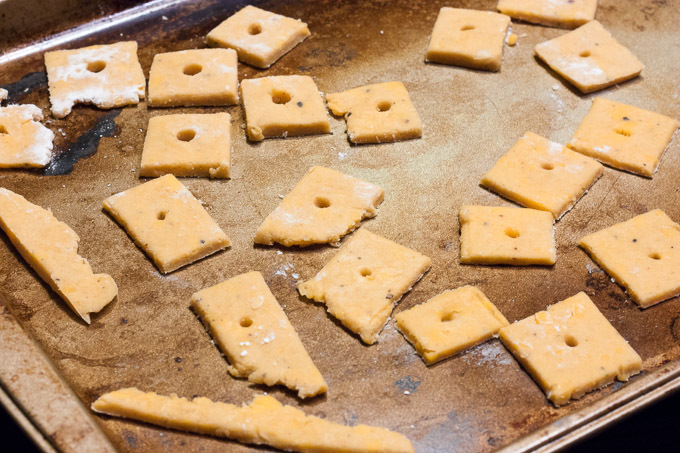 I’d never considered making my own crackers before and the thought of even meddling with the holy original Cheez-It formulation was sacrilege! I filed that exchange away for a future date. Fast forward a couple months and another friend, Sam, (I have at least two! Amazing, right?) said that his chemo had ruined the taste of Cheez-Its! THE INHUMANITY! 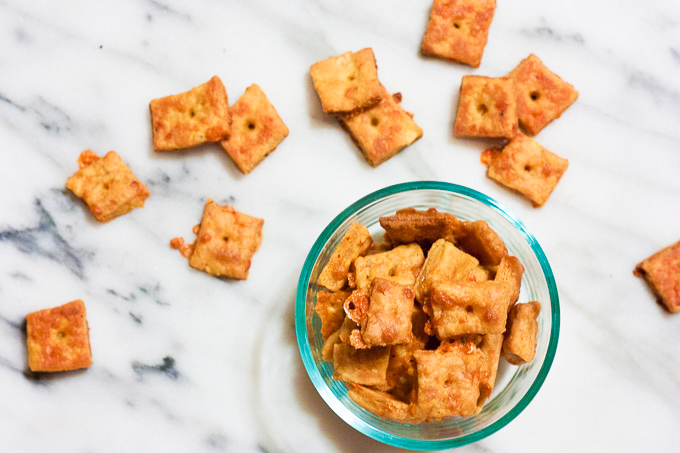 I couldn’t stand for the ruination of these tiny crunchy treasures so I decided to experiment, trying to find the cheesiest, spiciest, and garlic-iest cracker ever. And so began my foray into homemade cheese crackers with these Jalapeño Garlic Cheese Crackers. 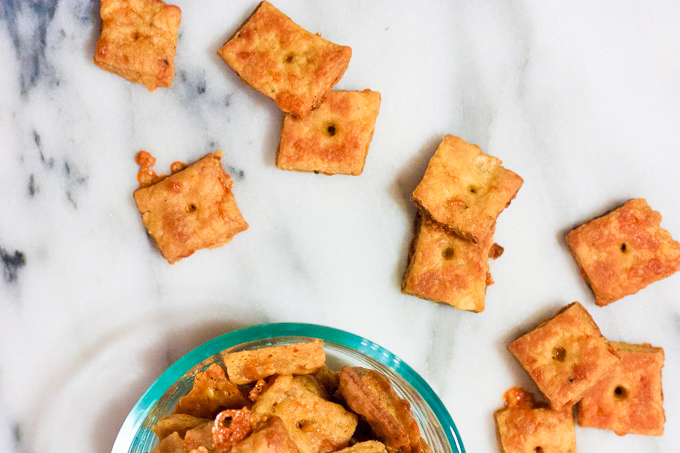 Cheese crackers are really simple. Cheese (a lot), flour, and butter. That’s pretty much it. I wanted to punch this batch up with a jalapeño and tons of garlic. 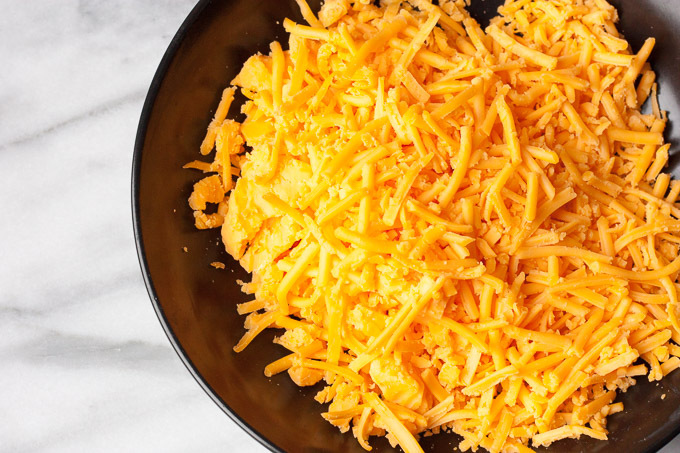 You can use any cheese you like, but I chose a sharp cheddar. 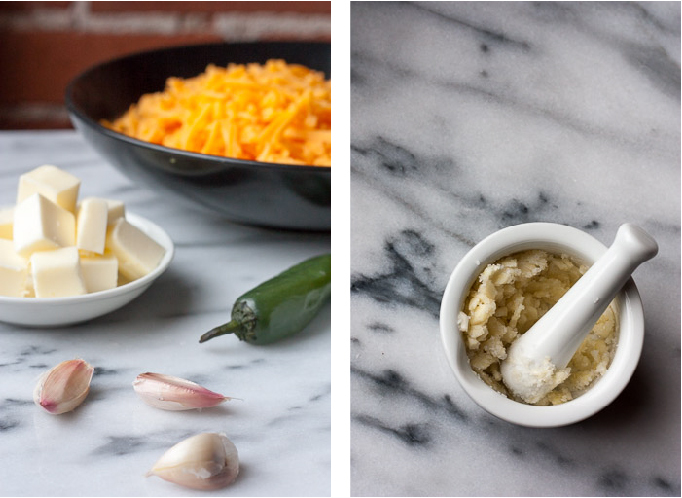 Grate the cheese and mix it well with the extras you want to add in. Then it makes this terribly sticky mess. 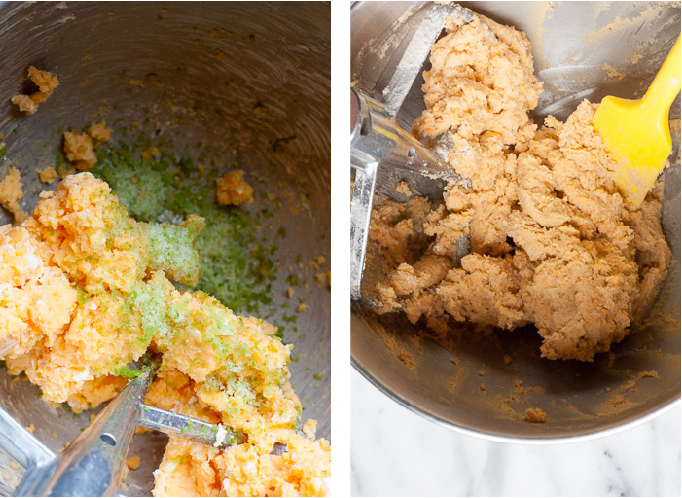 If your mixture looks too dry and isn’t coming together, add in a little water at a time to help it along. 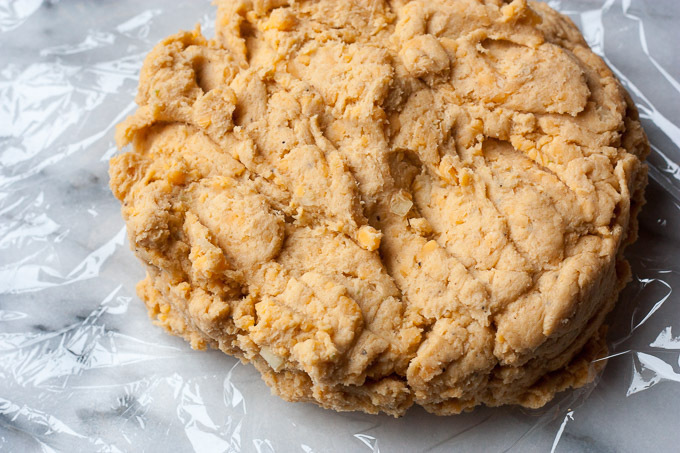 Once the ingredients are well combined, tightly wrap up the dough in plastic wrap and refrigerate to firm up. This helps when you roll out the dough. Since so much of the dough is fat, it gets hard to work with once it starts warming up, so try to keep it cool and work fast! While I do have a marble pastry slab, I rolled out the dough on the counter for two reasons. First I wanted to maximize surface area and I also didn’t want to run the risk of having my pastry slab smell and taste like cheese forever. Just lightly flour the counter and both sides of the dough disk before rolling out. And yes, the rolling pin is enormous, but it’s come in handy. You can easily roll out small sheets of dough with a large pin, but rolling out a large sheet with a small pin is much more frustrating. Ideally, you should roll out the dough to the thickness of a quarter. This might be hard as the dough is flimsy when it’s that thin, but the thinner the cracker, the crispier the Jalapeño Garlic Cheese Crackers bake up. I then used the side of my metal spatula to cut one inch strips. You can also use a knife or a fluted pastry wheel cutter, but I chose to used the long edge of the spatula to help keep the cuts straight and clean. It’s OK if your dough is not perfectly square, just straighten them out with a little trim. Once the strips are cut, make a perpendicular cut so you have one inch squares and punch a little hole in the center. I used the thin end of a chopstick, but pretty much anything small will work. It may seem annoying, but the hole will help prevent the cracker from puffing up too much. And while some of our Jalapeño Garlic Cheese Crackers aren’t perfectly square, they’ll taste just as good! Throw them onto the baking sheet as well and just eat them first before anyone has a chance to see them! While nothing can compare to the satisfaction of polishing off a newly opened box of Hot Cheez-its, these guys come pretty close. It’s probably a good thing that I didn’t make an endless supply of these guys. (I actually ended up burning the first batch, oops!) They keep well in a tightly sealed container in the fridge, but will eventually go stale. I noticed that the thicker ones go stale first, so there’s another incentive to roll them out thin. I suppose you can leave them out, but since there is so much dairy in these crackers, I chose to refrigerate them for storage. Also, your house will smell like cheese for a long time after the Jalapeño Garlic Cheese Crackers are out of the oven, so I hope you really love cheese. Add the cheese, butter, salt, pepper, garlic and jalapeños to the bowl of a stand mixer fitted with the paddle attachment. Mix on low speed until the mixture comes together and starts to stick to the sides of the bowl, about 30 seconds. Turn the dough out onto a lightly floured work surface and shape into a disk. Wrap in plastic wrap and refrigerate for at least 30 minutes. Preheat oven to 375 F. Line two baking sheets with parchment. 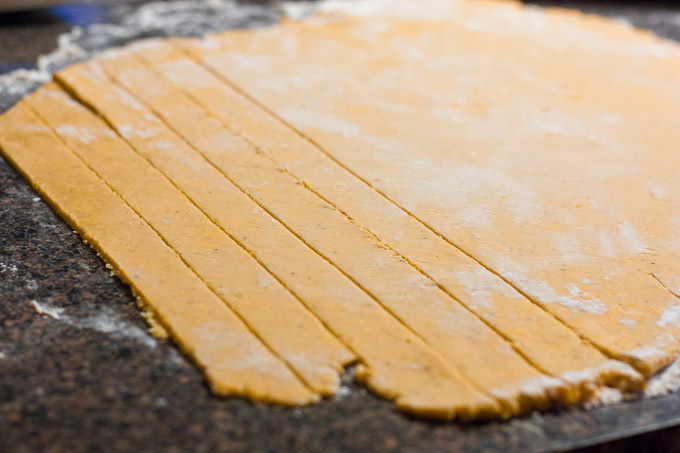 On a lightly floured work surface, roll out the dough to a thickness of 1/16-inch. 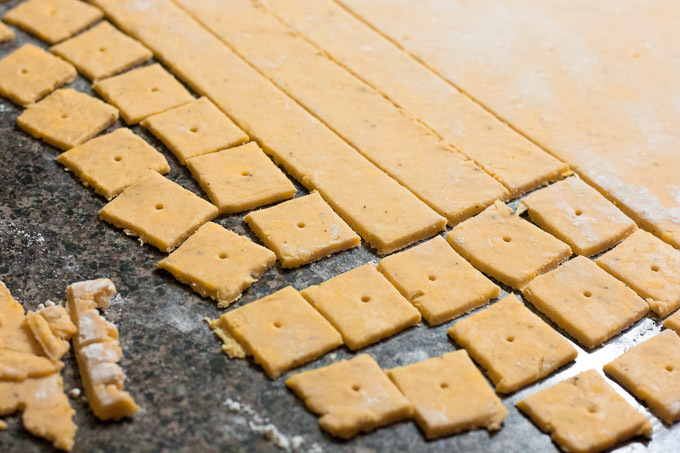 Using a knife or pastry cutter cut the dough into 1-inch wide strips, then cut 1-inch squares from those strips. Poke a hole in the center of each square. Transfer the squares to the prepared baking sheets. They puff up, but do not spread out so you can fit quite a few on each sheet. 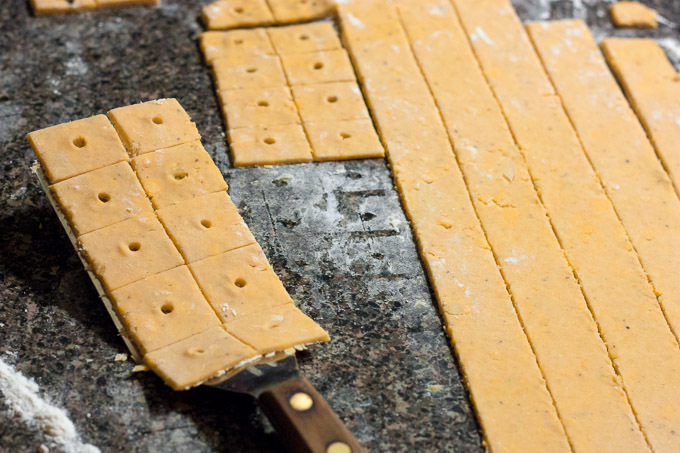 Bake the crackers until the edges just begin to turn gold brown, about 18-20 minutes. Allow the crackers to cool completely on the baking sheets. Crackers taste the best the day they are made, but do keep for a couple days in a sealed container. They do start to get stale and lose their crunchiness.